Third live CD of this Munich, Germany based acoustic band released in 2000 is their most multi-stylistic with bluegrass, blues, swing and Celtic folk songs and instrumentals. 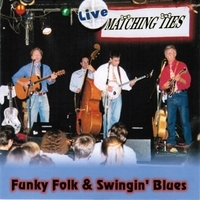 Matching Ties is a Munich, Germany based multi-stylistic folk and acoustic band which has appeared in concert throughout Europe and in the U.S. since 1986. Starting out as a bluegrass, acoustic blues and country band, their repertoire is now predominantly Irish, English and Scottish with a bluegrass, American acoustic twist. Members over the years come from the U.S., England, Ireland, Scotland and Germany. This album released in 2000 is taken from live recordings of several shows including a CD recording show in Munich. This was Matching Ties most ecclectic, multi-stylistic period where they played bluegrass, newgrass, blues, swing and an ever increasing amount of Irish, Scottish and English folk.